Cadet Carolyn Kehn ’18 teaches a proper salute to children at an orphanage in Haiti. Cadet Ungerman was one of more than 1,000 cadets who participated in an out-of-classroom work or research opportunity this past summer, as part of the Academy Scholars Program — a priority funding need for the Academy within the For Us All Campaign. This program offers experiential learning opportunities, often referred to as AIADs (Academic Individual Advanced Development), that enhance cadets’ education and leadership development. These experiences include internships at government agencies and corporations as well as cultural immersion opportunities abroad through which cadets train with foreign militaries or work with non-governmental organizations. 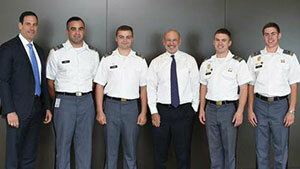 Cadets Corry Daoust ’16, Madison Hager ’16, John Sabert ’16, and Michael St. Denis ’16 met with Gary Giglio ’89 and Goldman Sachs Chairman & CEO Lloyd Blankfein while working at Goldman Sachs. 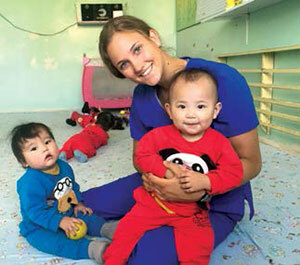 Cadet Abby Toth ’16, above, worked at a clinical care center in Mongolia, caring for children aged six months to four years. Whether abroad or within the U.S., these opportunities have been met with much success among cadets. Last year, more than 90 percent of participating cadets said they would recommend their experience to another cadet and the vast majority reported intellectual development beyond their academic major. Additionally, these experiences provide benefit to the organizations and companies for which cadets work. As a result the program’s widespread impact and popularity, the Academy aims to increase the number and variety of out- of-classroom experiences and provide every cadet with at least one of these opportunities over the course of his or her four years. In order to accomplish this goal, the Academy must rely on private funding, particularly in light of recent reductions in appropriated funding. Funding reductions were most severely experienced in 2013 during sequestration, which caused cadet participation to drop to less than 800 that year. Donations from graduates, families, and friends, which made up approximately 50 percent of the program’s funding this year, offset these funding gaps and provide greater stability to the overall program and its long-term goals.